Once served as the Chief of the Cherokee Nation, Chief Mankiller has been active in national and international issues of the Native American movement. However, her emphasis has been on local Native community development. TRIBAL SOVEREIGNTY, (56:00 min.s) recorded in a public forum Mar. 21, 1989 at Boulder, Colorado. 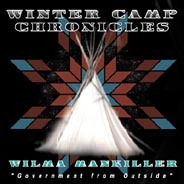 In this speech, Chief Mankiller reviews the history of the Cherokee experience, the evolution of Cherokee tribal government and her personal experience of being a woman Chief in tribal government. LISTEN to/or DOWNLOAD the FULL “The Future of Indian Nations” Speech!